And here we are. 36 beers cut down to the two best IPAs in California, Russian River Blind Pig and Alpine Duet. How can you go wrong with either? Blind Pig had a relatively circuitous route to the finals, surprisingly finishing second to Mad River Jamaica Sunset in Round 1. It thumped Eagle Rock Populist in Round 2, and took down top Round 1 performer Knee Deep in Round 3. Then it won a very close Round 4 heat, besting Green Flash West Coast and fellow semifinalist Port Wipeout, followed by close wins over Firestone Walker Union Jack and Lagunitas in the quarters and semis, respectively. Blind Pig is battle-tested- it's gotten some bumps and bruises, but it comes into the finals on a hot streak. Alpine Duet, on the other hand, has absolutely destroyed all challengers. It won its Round 1 heat unanimously over Cismontane Coulter and Karl Strauss Tower 10, followed by a not-as-close-as-the-score indicates 4-1 decision over Black Diamond Jagged Edge in Round 3. Duet thumped Alesmith and Bear Republic Racer 5 in Round 4, and then took Green Flash West Coast down unanimously in the quarters. And guess what? Another unanimous decision in the semis, this time over Port Wipeout. 5 rounds, only two non-winning votes. I'm no oddsmaker, but I think that's what you'd call a prohibitive favorite. Without further ado, the 2012 Non-Snob California IPA Tournament Champion: Alpine Duet. And yes, it was unanimous. But it was close. The judges took a fair bit of time in their deliberation- this wasn't one of those two-second decisions. Both beers were as fresh as can be- neither beer comes any other way around here unless you're dumb enough to cellar them (which I wasn't- these were purchased the day before the finals), because they get snapped up the moment they appear in stores. So they were at their maximum quality, and fresh Blind Pig is definitely capable of going toe-to-toe with Duet. But at the same time- unanimity is unanimity. Everyone knows that Russian River is one of the, if not the, best breweries in the country. Theirs may be the most highly-sought beers outside of California (well, in California too, but our access is a bit better). And Blind Pig bears that out- it's an incredible beer, exactly what a California IPA should be. But Duet- this beer is a revelation. 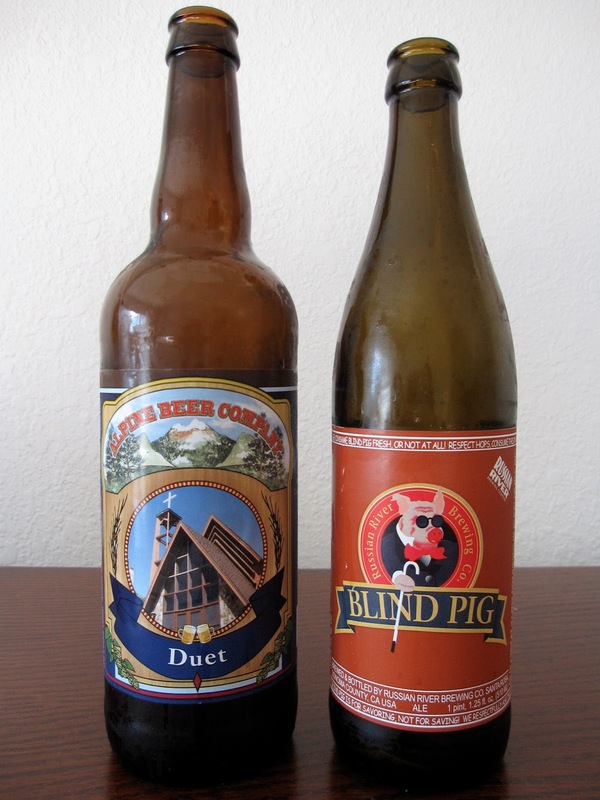 If Blind Pig shows you what a California IPA should be, Duet shows you what it can be. I don't know what they're doing differently out there in Alpine, but Duet is so far ahead of the game it's ridiculous. Alpine gets a volume of flavor out of its hops unequalled by any other brewery in California, while masterfully leaving the bitterness behind. And they've constructed the malt foundation with such craft and delicacy that you're able to taste every little bit of those hop flavors- I mean, name any other beer in which it's possible to pick out 3 or 4 individual citrus and/or tropical fruit flavors that are solely hop-derived (if you can, it's probably also from Alpine). That's why this beer won, and won so convincingly. They simply do something with their IPAs that the others don't, and probably can't, match. So that's it, a lot of time, a lot of beer, and one grand champion. It's been emotional. Special thanks go to Bine and Vine and Bottlecraft- it you're in San Diego and you want fresh IPA, these are the places to go. Extra special thanks to our ladies for putting up with our disappearing every few nights for beer-oriented adjudication. Thanks for reading- now back to regularly scheduled programming. OK it's finally over. Can we do it again please?? I'm still not sure about Blind Pig! Sorry, no. Next up is a 128-beer brown ale tournament. Don't make any plans for the next 19 months.